An excellent, 100-year-old, illustrated tutorial on how to properly kill and bleed poultry. Brain-sticking to loosen feathers for hand-plucking is also covered. This is must-have information for anyone who butcher's chickens and other poultry. This rare old bulletin goes into great detail explaining where the main arteries in a chicken's neck are located, where they intersect before going into the brain, and where to make a small slice (through the mouth, into the back of the throat) so that the birds bleed out cleanly. The details of this old technique are fully described AND illustrated with 5 clear drawings. 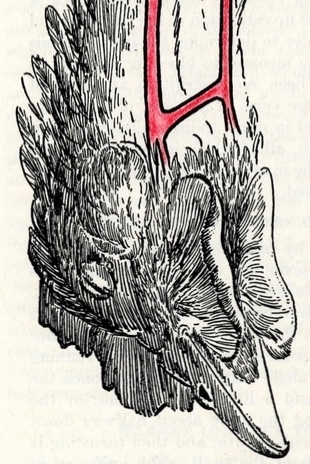 Also described in detail is the old-time technique of brain-sticking a bird to loosen the feathers for hand plucking. Instructions for making a small knife (out of a file) for killing and brain-sticking poultry are on the last page. Anyone who butchers their own poultry will find the information in this bulletin to be very useful. We here at Agriphemera have followed the instructions in the bulletin to kill and bleed poultry using an antique French Poultry Killing Knife made by the G.P. Pilling Company (see our download titled "Caponizing by George P. Pilling" for information and discussion of the French Poultry Killing Knife). But a stiff, narrow-blade knife of any kind would do the job just as well. Killing and bleeding by surgically slicing the artery in the back of the bird's throat definately works! It leaves the bird's neck clean of blood (something that was important in old-time poultry markets) but we didn't think it bled the birds out as quickly as a carefully-placed slice of the arteries from the outside of the the neck. That said, the excellent anatomical, head and neck illustrations in this bulletin can be utilized to deternine exactly where it is best to make a neck bleeding cut, without severing the bird's trachea and esophagus, which is to say... without causing unnecessary pain and trauma to the bird. Our poultry neck-bleeding skills improved significantly after reading this bulletin. It is safe to say that after reading this Agriphemera reprint, you will be able to much more intelligently kill and bleed the poultry you butcher.